If you liked the other books in the Daily Discoveries series, you'll love this one, too! 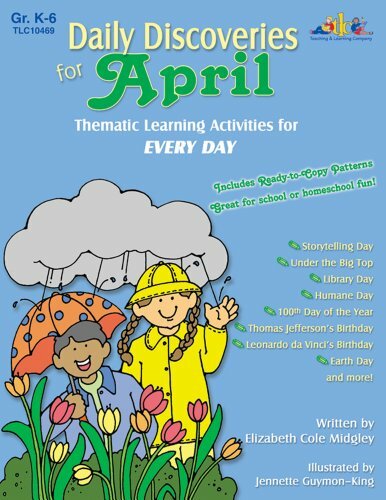 It's filled with special days to celebrate in the classroom throughout the month of April. Special days include: Under the Big Top Day, Castle Creations Day, Paul Revere Day, Train Day, Newspaper Day and 25 more. Use the activities to spice up regular curriculum: language arts, social studies, writing, math, science and health, music and drama, physical fitness, art, etc. Included are reproducible patterns for writing assignments and art projects, lists of correlated books and bulletin board ideas. Your students will look forward to each day in your classroom when it's a day to celebrate! Elizabeth enjoys children of all ages, but has a special affinity for the very young. She received her Elementary Education degree from Brigham Young University and has taken several graduate courses towards a Masters in school counseling. She is a published author and keynote speaker for fellow teachers. She has taught parenting classes for local communities and taught in the primary grades since 1981. She currently teaches first grade. Elizabeth lives with her family in Utah where she is a busy mother of two boys, Daniel and Matthew.